FLAC format is only an audio file format whereas MP4 is a container where people can store audio, video, images and subtitles. FLAC format is very less known among the end users but that’s why there are very less media players available which supports FLAC format to play files. This is the reason why people like to convert FLAC to MP4. If you have any FLAC format files on your computer then you can also convert these files to the MP4 format. Let’s look at how to convert FLAC to MP4 in this guide today. Many people think that it is only possible to convert FLAC to MP4 or other format using a desktop video converter but now there is no need to use software if you need only conversion. KeepVid Online Converter is a solution to convert FLAC to MP4 and more than 60 other formats online without any installation. It will convert the video or audio in the browser directly with very easy steps. You only need to select the file from system, choose target format and finally click “Convert now” to start conversion. KeepVid Video Converter is another desktop solution from KeepVid website itself. This is software for the people who like to convert the videos in professional way and original quality. This program is a converter, downloader and editor for you. 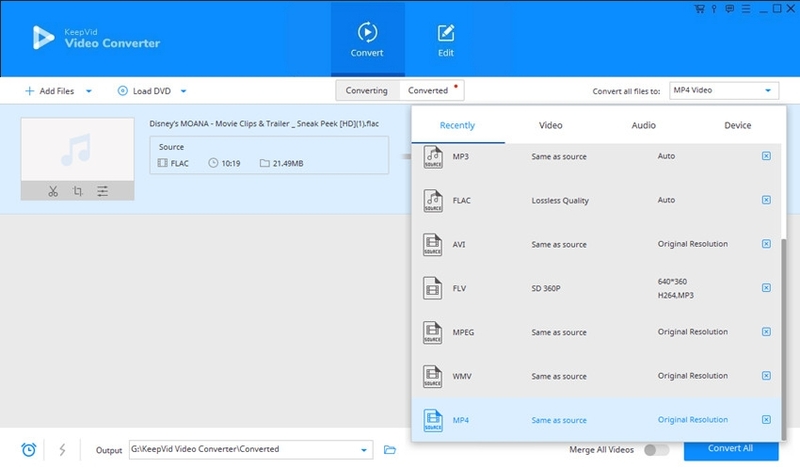 FLAC to MP4 converter is very easy to use software available to install on windows and Mac operating systems with full compatibility of all Mac and windows versions. You are able to convert audio and videos to HD formats using this converter software. There are 1000+ formats are supported by this software so you are free to convert videos in any of your favorite format.  You can sequentially convert multiple videos together with this program. 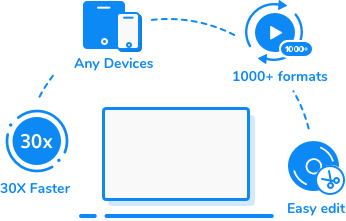 If you need any video or audio from internet then you can download it using this program because it supports 10000+ sites for downloading multimedia files. If you are not satisfied with your video then you can edit it using the editing feature of the program. Step 3 – Lastly, select the preferred file format, i.e. MP4, from the available audio formats and hit “Convert Now” button. Installation is required to start using this converter software so download the installation file from the official website and install it on your system. Launch and click on add files button at the top left corner once installation is finished. Choose FLAC format file from computer and then click open button. Now you have to select the target format. To choose format click on inverted triangle button in the top right corner and select MP4 as the output format. Once everything is setup just click on the “Convert” button in next to the added video. Program will start conversion of video now but you can always add more files to convert because it supports batch conversion.